West Colfax Avenue suffers from an identity crisis. It was designed to move motor vehicles in and out of the city as fast as possible, but it’s also a neighborhood street where bus riders, families, and shoppers abound. The result is a thoroughfare that caters to motorists, but not to the people who actually live, work, and walk there. 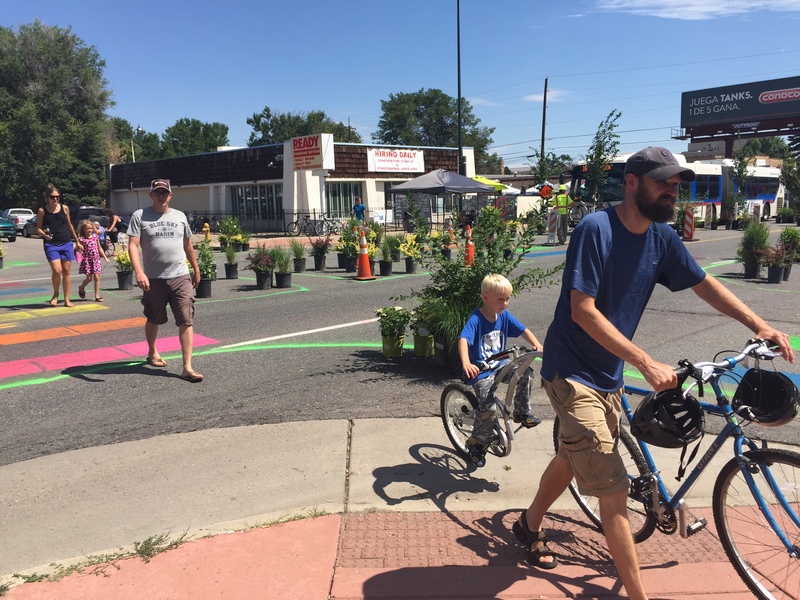 On Sunday, Denver’s livable streets advocates reminded the public that West Colfax is a place for people, with a six-hour pop-up road diet between Utica and Tennyson streets. Where a travel lane once stood, visitors congregated in “parklets” (miniature parks) bound by plants, palettes, and paint. Badly needed and brightly colored crosswalks complemented temporary bulb-outs that slowed drivers as they passed, creating a true pedestrian environment. People on bikes rode on protected bike lanes constructed with bollards and small planters. There was music and beer, too, but the pop-up served as more than just a good time. It was a demonstration that proved what the community wants: a complete street for all to use safely and comfortably. WalkDenver surveyed attendees and found that they liked wider sidewalks, bike lanes on Colfax, and crosswalks with pedestrian-activated signals the best. Permanent changes to West Colfax have to be the end game. While city agencies concerned about costs and disrupting traffic can be resistant to changing streets like West Colfax, the demo makes the demand for change hard to deny. “Part of the reason we were very deliberate about community feedback is because our next step is to hold a debrief session with Denver Public Works, CDOT, and RTD, and share with them the pictures, the data, and the comments to demonstrate the level of support for making these types of communities,” said Jill Locantore, WalkDenver’s policy and program director. Inevitably CDOT and DPW reps will convey concern over how making West Colfax walkable will affect driving time. But any heartburn over how cars might be affected is moot. West Colfax is one of RTD’s most heavily traveled bus routes, which means high pedestrian volumes. Yet a lot of areas don’t have crosswalks, forcing people to walk 15 or 20 minutes out of their way to cross Colfax safely. Compare that to Boulder’s Folsom Street, where reclaiming a car lane for people has sparked “bikelash” over a tiny increase in average drive time — a little over two minutes. 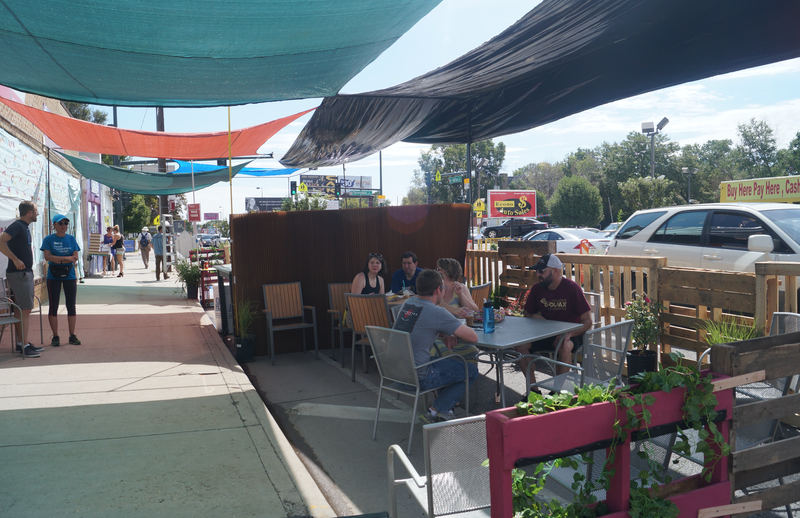 Permanently reclaiming a travel lane isn’t necessarily a priority on West Colfax, Locantore said, but she’s ready to defend the demo as a first step toward a permanent redesign with funding and support from the city. Demos are a great first step to getting risk-averse city agencies on board with cheap, semi-permanent street treatments that are easy to alter, if necessary, or make permanent when they work well. DPW, CDOT, and RTD know about the demo because they provided technical support. Community backing for a complete West Colfax is inarguable. Now it’s up to these agencies to give residents what they want.